Power (the Lion) and deception (the Fox) are the two essential means for the conduct of foreign policy, according to the political teachings of Machiavelli. The supreme political value is national freedom, i.e., independence. The main responsibility of rulers is always to seek the advantages and to defend the interests of their state and thus ensure its survival. That requires strength; if a state is not strong it will be a Standing invitation for others to prey upon it; the ruler must therefore be a lion. That also requires cunning and--if necessary --ruthlessness in the pursuit of self-interest: the ruler must also be a fox. if rulers are not astute, crafty, and adroit they might miss an opportunity that could bring great advantages or benefits to them and their state. Even more importantly, they might fail to notice a menace or threat which if not guarded against might harm or even destroy them, their regime, and possibly even the state as well. That rulers must be both lions and foxes is at the heart of Machiavelli’s realist theory. Classical realist IR theory therefore is primarily a theory of survival. ● The overriding Machiavellian assumption is that the world is a danervous place. But it is also, by the same token, an opportune place. if any political leader hopes to survive in such a world, he or she must always be aware of dangers, must anticipate them, and must take the necessary precautions against them. And if they hope to prosper, to enrich themselves, and to bask in the reflected glory of their accumulated power and wealth, it is necessary for them to recognize and to exploit the opportunities that present themselves and to do that more quickly, more skilfully and---if necessary-- more ruthlessly than any of their rivals or enemies. The conduct of foreign policy is thus an instrumental or ‘Machiavellian’ activity based on the intelligent calculation of one’s power and interests as against the power and interests of rivals and competitors. ● That shrewd and sober outlook is reflected in some typical Machiavellian maxims of realist statecraft, including the following: Be aware of what is happening. Do not wait for things to happen. Anticipate the motives and actions of others. Do not wait for others to act. Act before they do. The prudent state leader acts to ward off any threat posed by his or her neighbours. He or she should be prepared to engage in pre-emptive war and similar initiatives. The realist state leader is alert to opportunities in any political situation, and is prepared and equipped to exploit them. ● Above all, according to Machiavelli, the responsible state leader must not operate in accordance with the principles of Christian ethics: love thy neighbour, be peaceful, and avoid war except in self-defence or in pursuit of a just cause; be charitable, share your wealth with others, always act in good faith, etc. Machiavelli sees these moral maxims as the height of political irresponsibility; if political leaders act in accordance with Christian virtues, they are bound to come to grief and they will lose everything. Not only that, they will sacrifice the property and perhaps the freedom and even the lives of their citizens, who depend upon their statecraft. The implication is clear: if a ruler does not know or respect the maxims of power politics, his or her statecraft will fail and with it the security and welfare of the citizens who depend absolutely upon it. In other words, political responsibility flows in a very different vein from ordinary, private morality. The fundamental, over riding values are the security and the survival of the state; that is what must guide foreign Policy. 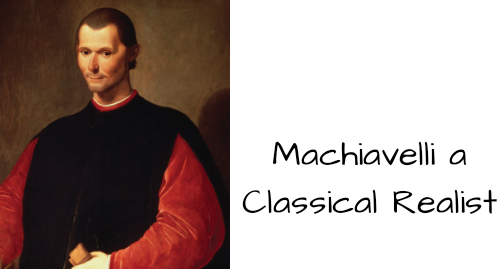 ● Machiavelli's realist writings are sometimes portrayed as ‘manuals on how to thrive in a completely chaotic and immoral world’. But that View is somewhat misleading. it overlooks the responsibilities of rulers not merely to themselves or to their personal regimes but also to their country and its citizens: what Machiavelli, thinking of Florence, refers to as ‘the republic’. This is the civic virtue aspect of Machiavellian realism: rulers have to be both lions and foxes because their people depend upon them for their survival and prosperity. That dependence of the people upon their ruler, and specifically upon the wisdom of his or her foreign policy, is owing to the fact that the people’s fate is entangled with the ruler's fate. That is the normative heart not only of Machiavellian realism but of classical realism generally.